The key to successfully fighting breast cancer is early detection. Breast cancer symptoms can share the characteristics of other conditions, so proper testing by doctors is essential. 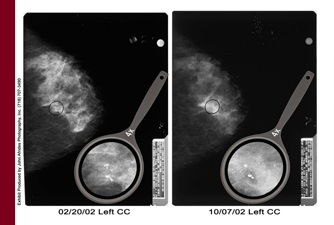 Tests such as mammograms and biopsies are commonly used by the medical profession to detect breast cancer. Many times doctors fail to even order these crucial tests. There are also situations where the proper tests are ordered, but the radiologist misreads the film or the pathologist misreads the slide, leading to a crucial delay in making the diagnosis. Delay in diagnosing cancer can worsen the treatment or prognosis or can even be fatal. Our team of attorneys includes a board-certified physician and a professional registered nurse who can assist in reviewing your case and help you to understand the full medical scope of your claim. Attorney Jeffrey Bloom has served as the Chairperson and lectured in New York State Bar Association-sponsored programs including one entitled "Medical and Legal Issues in Breast Cancer and Gynecological Cancers and Surgery". Attorney Stephen Mackauf has lectured on breast cancer litigation at several seminars and institutions and published numerous articles including "Failure to Diagnose Breast Cancer: The Perspective of a Patient's Attorney." Our firm conducts exhaustive investigations, and we retain the most qualified experts to bring a comprehensive level of expertise to surpass that on the other side. For example, when a doctor fails to diagnose breast cancer, we seek out and retain a practicing breast cancer specialist to determine the full circumstances of the misdiagnosis and in the event of a misread mammogram, we will find an expert radiologist to examine the films. If your breast cancer went undiagnosed by a doctor or was misdiagnosed, please contact our firm to discuss your case. $2,300,000 settlement on behalf of a woman whose doctors failed to timely diagnose her breast cancer. $2,000,000 settlement in a medical malpractice case for failing to diagnose breast cancer. $1,950,000 in a Westchester county medical malpractice case in which doctors failed to timely diagnose breast cancer. $1,875,000 Nassau county medical malpractice case in which doctors failed to timely diagnose breast cancer. $1,575,000 verdict on behalf of a woman whose doctors failed to make a timely diagnosis of her breast cancer.